The ultimate piece and conversation starter for wine lovers—this exclusive coffee table stores an impressive 84 bottles beneath its glass surface. Keep your most prized and vintage bottles on top-row display. Convenient double doors allow for easy access to all bottles without disturbing items displayed on top. Crafted from age-old materials to last for years to come, its sturdy industrial-chic design is perfect for a variety of settings. Iron is finished in antique nickel. I love the Chair in the pic. Is there a way to find out what brand it is? BEST ANSWER: The chair is called the Wagner Swivel Chair, item number 335 21 17. There is a matching swivel ottoman available also, item number 335 21 18. 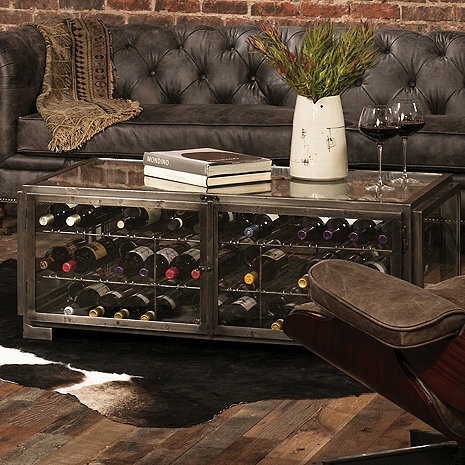 BEST ANSWER: The Hermitage Wine Storage Coffee Table does not have casters. I think you might be able to add them if you wanted to. Thank you so much for your reply! In your opinion, can it be put on wheels? Are there any holes in the base of each leg? BEST ANSWER: No but i absolutely love it and every time someone walks in my house, they complement me on it. Definitely a great buy. Just get a wine cooler for you expensive bottles and use the table for your stairage and every day bottles. If you have any questions about storing wine, just email me and i can answer your questions. I’m a wine distributor. I am interested in this table, but would love to hear from someone who has one. Is it easy to keep clean or do crumbs get between the glass and the frame? Also, does the glass scratch easy? BEST ANSWER: The Hermitage Wine Storage Coffee Table has a glass top to it, so glass cleaner is the best way to keep it clean. The glass doesn't scratch easily and I don't think crumbs will be an issue to remove. Where can I buy the cool gray leather couch and chair in the photo!? BEST ANSWER: The Hermitage Wine Storage Coffee Table is shown with the Cromwell Sofa, Item # 335 21 12. This is a classy beautiful piece of furniture. Handsome in the living room. Of note, cleaning does become a problem as crumbs easily fall in between the glass and the iron. Also surprisingly easily chips.